Chimney Swifts are among many avian Neotropical migrants which are showing a statistical decrease in population. These birds historically nested and roosted in hollow trees. As American pioneers moved westward across the continent, they cleared forests and removed the swifts' natural habitat. The birds that Audubon called American Swifts became known as Chimney Swifts as they readily adapted to the masonry chimneys erected by those same pioneers. Over the decades, the range of the swifts expanded and their numbers swelled with the ever increasing availability of this new, man-made habitat. However, changes are again challenging this adaptable species. Most new chimney construction uses metal flue pipe rather than stone or clay. Chimney Swifts require roughly-textured, vertical surfaces in which to roost and construct their nests. The surface of the metal is not only too smooth to be useful to the swifts, it can also be a death trap to the unsuspecting birds. To compound the problem, many suitable chimneys are being capped by intolerant or ill-informed homeowners who are unaware of the beneficial aspects of housing avian insectivores. The preservation and proper maintenance of existing nest sites is critical to the future of Chimney Swifts, but these efforts alone may be insufficient.The summer skies are filled with many species of birds. However, none seem to be as much at home on the wing as the Chimney Swifts. While even the graceful swallows must perch to preen and socialize, the Chimney Swifts flicker on, chippering and careening endlessly throughout the day. 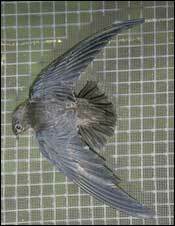 Small, sleek, bluish-black with silver-grey throats, Chimney Swifts have been called "flying cigars" and "bows and arrows." Their stiff, flickering movements alternate with long, graceful sweeps of flight as they scour the skies for flying insects. As captivating as their flight is to watch, their clandestine terrestrial behavior is even more remarkable. Unable to perch or stand upright as songbirds do, Chimney Swifts are uniquely equipped to roost clinging to vertical surfaces. Their small but strong feet are tipped with four forward-facing claws which act as grappling hooks to hold them firmly to their roost. Their tail feather shafts extend as stiff exposed spines to provide additional support for their vertical lifestyle.Although they will occasionally roost in the open, Chimney Swifts prefer the safety of an enclosed area such as a chimney, air shaft or abandoned building. It is in these inaccessible locations that they not only roost but build their nests, raise their families and congregate prior to migration. The adaptation by Chimney Swifts to make use of man-made structures is a result of deforestation and the loss of large hollow trees as natural roosting and nesting sites. This ability to adapt has not only allowed Chimney Swifts to survive as a species, but it has caused their range to greatly expand. As recently as the 1940's, Chimney Swifts were rarely sighted west of the Mississippi River. They are currently common from the east coast to the foot of the Rocky Mountains. While Chimney Swifts would seem to be an exception to the generally declining populations of migratory birds, the pendulum may be swinging back against them. Chimney Swifts commonly roost together in large numbers in a single shaft. However, each breeding pair must have a site of their own to raise their young. This becomes a problem with the advent of metal chimneys and the increasing desire of home owners to cap their chimneys. Suitable nesting sites will be harder to find.